In early 1823, John Adam, acting Governor General of India, circulated an ordinance making it obligatory for all newspapers and periodicals to get license for running their operations. Immediately, six distinguished personalities, including Rammohan Roy and Dwarkanath Tagore, filed a petition in the Supreme Court to prevent this wicked attempt. But the court rejected their appeal saying that India is not an independent country, so the laws and rules consistent with an independent state cannot be applicable here. 195 years have gone. Colonial East Bengal is now independent Bangladesh, but the ghost of Adam’s law seems to still haunt the media of the country. Restrictive guidelines and associated practices have been retained and used by successive governments for shrinking freedom of press which ultimately impinges on media’s roles as public watchdog and the torchbearer of democracy. Since obtaining independence journalists of Bangladesh have done their job by fighting against different debatable laws including Printing Presses and Publications Act 1973, Special Powers Act 1974 and Information and Communication Technology (ICT) Act 2006. 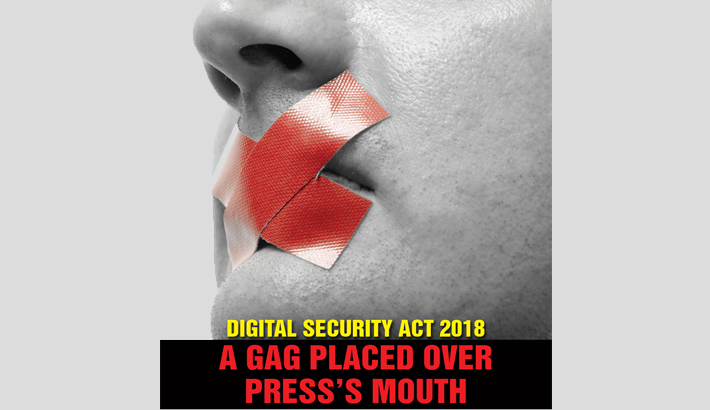 But the latest bill that has stunned the journalist community as well as the whole nation and surpassed all previous examples of growing state control over press is the Digital Security Bill 2018. It was passed in the Parliament on September 19, ignoring the concerns of journalists and rights activists. The Parliamentary Standing Committee on Post, Telecommunication and ICT submitted its final report on the much-debated bill before the House unilaterally on September 17 albeit it promised to hold another session of talks with the stakeholders before placing the bill. General Secretary of Editors’ Council Mahfuz Anam, President of Association of Television Channel Owners’ (ATCO) Mozammel Babu and former President of Bangladesh Federal Union of Journalists (BFUJ) Manzurul Ahsan Bulbul came up with the remark in a joint statement on September 22. Besides, Dhaka Reporters’ Unity in a statement on September 24 termed the bill as contradictory to basic human rights and democracy. International NGOs and rights bodies expressed their grave concern over the passage of Digital Security Bill 2018 in the 39th session of the UN Human Rights Council. Amnesty International, ARTICLE 19, Ain o Salish Kendra and Transparency International Bangladesh called the government to reconsider the controversial sections of the bill. The Committee to Protect Journalists in a letter to President Abdul Hamid urged to return the bill for a review. It is mentionable that on April 20 this year, after a discussion with the senior journalists, Law Minister Anisul Huq said that the concerns raised by the Editors’ Council over some sections of the proposed Digital Security Act are largely logical. Following his advice when Editors’ Council, ATCO and BFUJ representatives sat with the Parliamentary Standing Committee on Post, Telecommunication and ICT and placed an 11-point reform proposal in three consecutive meetings respectively held on April 22, May 22 and July 4, every time the JS committee assured that they will consider their arguments and discuss again with them before placing the bill in the House. Consequently a meeting was scheduled to be held on July 16 for further discussion with the organisations but it was postponed and no fresh date was announced afterwards. Without discussing with the three organisations and making any major change in its draft, Post, Telecommunication and ICT minister Mustafa Jabbar placed the bill in the Parliament. Placing new bill is a common incident in any Parliament session. At least 14 bills have been passed in the 22nd session of the 10th Parliament. But none of the bill turned as debatable as the Digital Security Bill 2018. What provisions have been put in the bill? Why has it become controversial? Let’s have an intimate look into it. According to the Section 21 of the bill, anyone spreading propaganda against the Liberation War, the spirit of Liberation War, the Father of the Nation, national anthem or national flag, using digital devices or instigating to do so, will be sentenced up to 10 years in jail or a fine of up to Tk 1 crore or both. This section has given birth to a number of questions. For example, how will you define the spirit of Liberation War? Which acts will be considered to be against the spirit of Liberation War? Unfortunately the bill has been passed without specifying answers of these questions. Section 25 of the Digital Security Bill 2018 says, “A person will be awarded 3 years imprisonment or Tk 3 lakh in fine or both if he or she is found to have deliberately published or broadcast in a website or any other electronic form something which is attacking or intimidating or knowingly publish or broadcast false and distorted (full or partial) information to annoy or humiliate someone or to tarnish the image of the state or to spread rumours.” If a journalist publishes or broadcasts news about corruption, it will definitely intimidate or annoy someone and tarnish his/her image. Then will that journalist be punished? Let’s come up with another example. Suppose a journalist has published or broadcast news about default loans of our banking sector. If any organisation out of prejudice interprets this work as an attempt to tarnish image of our country and its economy, then what will happen to that journalist? The bill mentions in its Section 28 that a person may face up to 5 years in jail or Tk 10 lakh in fine or both if he or she is found to have deliberately published or broadcast something in website or in electronic form or gets it done to hurt one’s religious sentiment and values. This section doesn’t define the term ‘religious sentiment’ and how it can be hurt. So, there is enough possibility of victimising newsmen. For example, if a journalist records video of a contentious khutbah or waz mahfil and publishes or broadcast news about how fundamentalism is spreading all around referring to it, then any religious extremist can file case against him/her in accusation of hurting religious sentiment by recording the video. Section 31 of the new bill says, “A person will be awarded 7 years in jail or Tk 5 lakh as fine or both if he or she is found to have deliberately published or broadcast something in website or in electronic form which can spread hatred and create enmity among different groups and communities and can cause deterioration of law and order.” To clarify the point further, if law enforcement agency members attack a group of agitated Muslims indiscriminately, a journalist’s responsibility will be to inform his/her readers or viewers about the fact after verifying the incident. It may excite other Muslims and they can get involved in a conflict with the law enforcement agency members which ultimately can deteriorate law and order as well. But will that journo be responsible for the consequences of the incident? According to section 32 of the Digital Security Bill 2018, a person will be jailed for 14 years or fined Tk 25 lakh or both on charges of violating ‘Official Secrets Act, 1923’! Earlier, the title of section 32 was ‘crime and punishment for computer and digital spying’! After observing serious disagreement of the journalists regarding it, it has been changed to ‘crime and punishment for violating state secrecy’ adding the ‘Official Secrets Act, 1923’! Reintroduction of this colonial act will prohibit journalists to enter the government and semi-government offices and collect information and documents of corruption using computer, digital device, computer network, digital network or any other electronic form. Many provisions of the controversial Official Secrets Act, 1923, directly contradict with the Right to Information Act, 2009. As per section 43 of the new bill, a police official can search or arrest anyone after taking approval of the director general of the proposed digital security agency! He/she doesn’t require a warrant issued by a court! The act mentions that if a police officer believes that an offence under the proposed law has been committed in a certain place or is being committed, or there is a possibility of crimes, or there is a probability of destroying evidence, he or she can search the place or any person present there. This section provides the lower-ranking police officials with wide discretionary powers to conduct investigations, searches and seizures and accuse journalist without applying normative digital evidentiary standards and judicial oversight. All these sections of the bill include provision of double or triple punishment for committing crimes for the second time. Apart from these sections journalists informed the Parliamentary Standing Committee on Post, Telecommunication and ICT about their observation on Section 8, 29 and 31, but the JS committee didn’t pay heed to it. Though sections 54, 55, 56, 57 and 66 of the ICT act have been repealed, but the section 57 has been restored through the sections 25, 28, 29 and 31 of the new bill! Moreover reintroduction of infamous Official Secrets Act, 1923, through section 32 is a shameful example of colonial legacy. Allowing police to arrest without a court warrant is a clear threat to the freedom of speech and freedom of press that is guaranteed by the Article 39 of our constitution. Besides, according to section 53 of the bill, there are 14 non-bailable sections including sections 17, 19, 21, 22, 23, 24, 26, 27, 28, 30, 31, 32, 33 and 34, which are quite a threat to the fundamental rights. There is no denying the fact that a time-befitting Digital Security Act was necessary to prevent cyber crimes and punish cyber criminals. But the way the government has brought a number of controversial sections with broad and vague provisions in the Digital Security Bill 2018 to dominate media reveals all its intents and purposes. BFUJ urged them to include a provision to settle the accusations against journalists under this law through press council, but the Parliamentary Standing Committee on Post, Telecommunication and ICT rejected the proposal. They avoided three media organisations before passing the bill only to impose their opinion. When the Parliament creates laws, one prohibiting police from arresting government employees without prior approval and the other allowing them to arrest journalists and others without a court warrant, it clearly shows to what extent government is patronising discrimination. Their attitude towards journalists proves that they are not liberal enough to accept criticism and want to create influence over press. And it ultimately defines the nature of governance in our country. But the truth is that as long as the government will see the journalists as their foes, they will never find a friend. In the meantime it is worth mentioning that this act will not only affect the journalists but also the commoners. Cross-sections of people may face unexpected hassles owing to some of the provisions in the act. The government should take all these points into account.